Be cool while keeping warm and giving light. 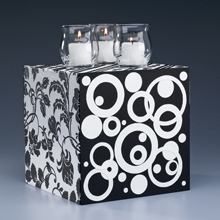 In only three easy steps and using paper card stock you can have a black and white candle holder. Note: This design easily adapts to your own sense of style and you can substitute your choice of papers. Cut six 8" paper squares. If desired, create patterned paper on solid cardstock by cutting and/or punching solid and open circles from contrasting cardstock. To make open circles, use template to cut larger circle and craft punch to create center. Layer and adhere circles to base; let dry. Use putty knife or credit card to spread thin layer of paste onto one side of foam cube and on back of one paper square, spreading paste all the way to edges. Adhere paper to foam, smoothing with fingers to ensure good contact. Repeat for all six sides. Wipe away excess paste with damp sponge; let dry. Place candles in holders and place on top of cube. For added security, use industrial-strength adhesive gel to adhere holders to top of cube. Never leave burning candles unattended.